It has been a chilly, rainy first week back after winter break in SoCal! My students and I spent the majority of the week together inside the four walls of our classroom. Good thing I love them so much! :) I'm always curious how they will return from break. Sometimes they need a little time to re-adjust to the academics, and sometimes they jump right back into the learning. This time, my students were CRAVING the learning! We did counting collections, word problems, independent and partner reading, how-to writing, and a new word study sort! Just as a reminder, this is what our kindergarten day looks like. 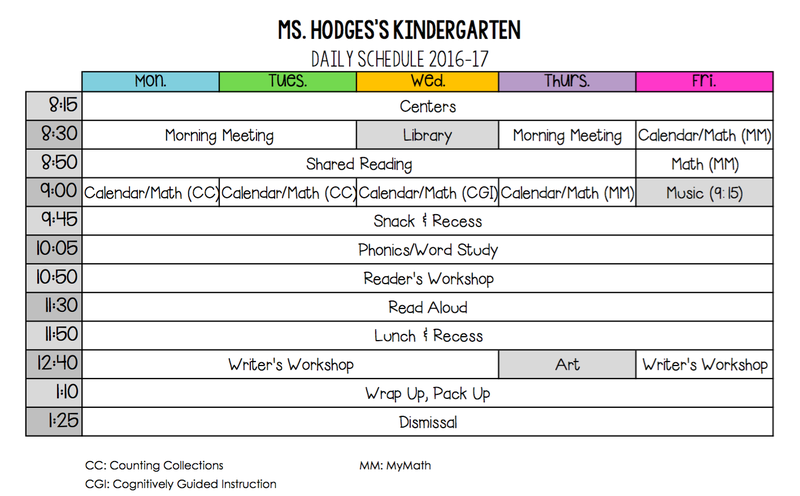 I've blogged in this series so far about our Play Centers, Morning Meeting, and Math times. My students were so excited to get back into our routines after break that I barely had to do any reteaching. I still did some, though, because all kids (and teachers) need a refresher! 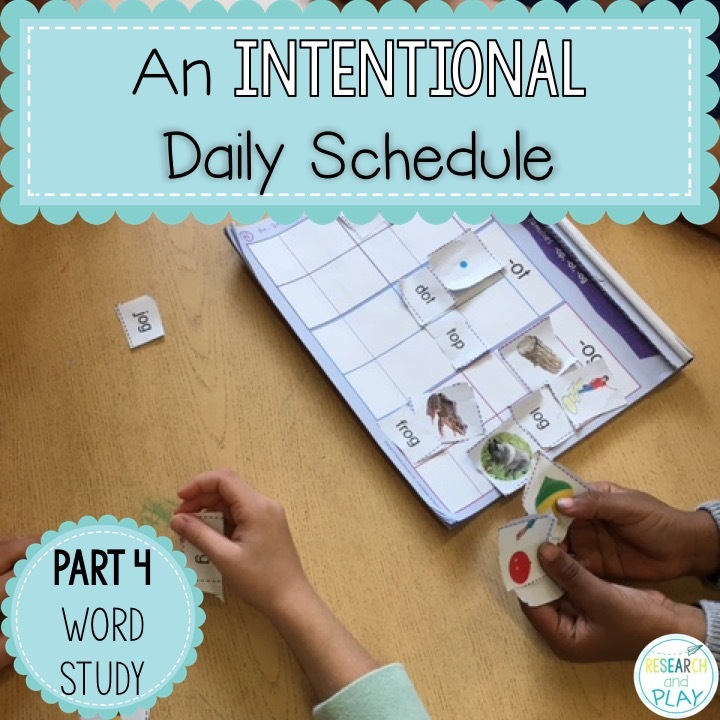 Let's focus today on our Phonics/Word Study time, which I'll refer to mostly as just Word Study. I've decided to stop calling this time of day "Phonics" for a reason. It's what the card said on my daily schedule so that's what the students and I have always called it! I knew that I would be teaching phonics-based skills during this time, so it made sense to me. But if anyone would come into my classroom and ask a student, "What is phonics? 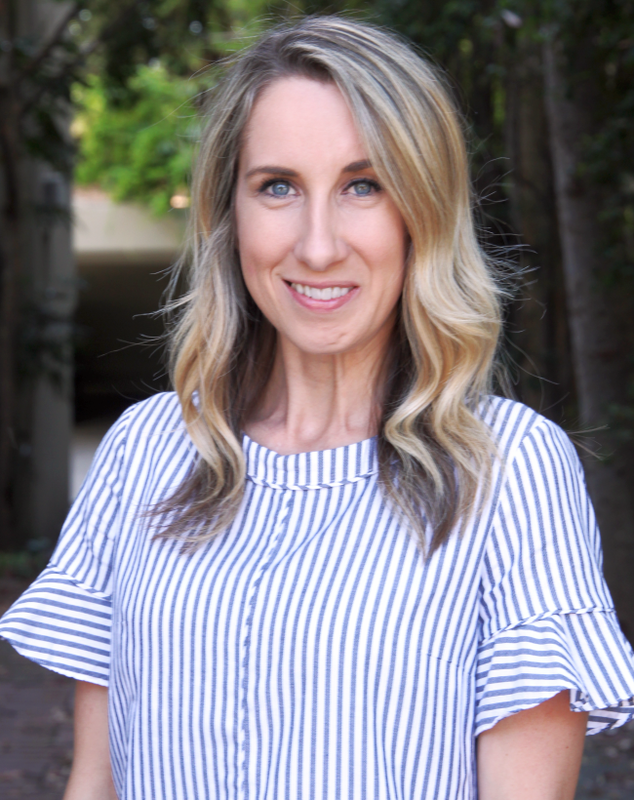 ", I really don't think they'd be able to answer that question...and students should ALWAYS be aware of what they're learning and why! So now we refer to this time of day as Word Study, because that's what we're doing! We are studying words. Parts of words like the beginning, middle, and ending sounds, digraphs (I actually DO use that word with my students! ), vowel partners, or blends. We also study word families, rhyming words, sight words, snap words, or vocabulary words. So now if anyone were to ask one of my students, "What is word study? ", I hope they would be able to explain that it means we are learning about words! I've written about how we use Words Their Way in our classroom in this blog post, head there to read about it in detail! A simple explanation is that my students work on a particular sort that correlates with their skill level during a 4-day rotation. That part of Word Study does not change. We are always working on a sort each week and it always takes four days to complete. What happens once their task with their sort is done is what is flexible during those four days. All of the pictures above are from each of my four word study groups on the same day. 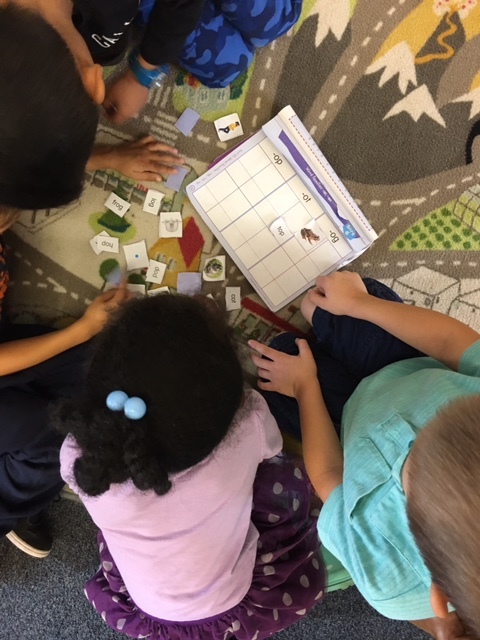 They were all working together to complete their group sort. 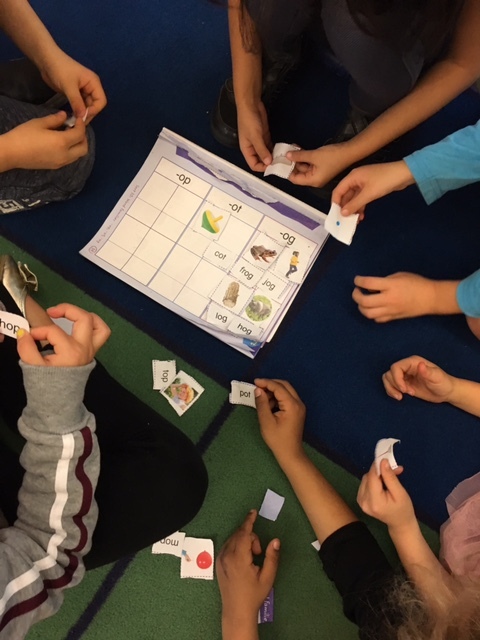 Afterwards, they partnered up to complete their partner sort, then finished word study time with their individual speed sorts. To read more, click HERE! When I first adopted a workshop model classroom, I had to get rid of my quintessential "centers" time because it simply did not fit anywhere anymore! I didn't like it, but I wanted to really give workshop a shot. However, I've finally figured out a way to get centers, or what we call "word study tubs," back into our classroom! If you've read the Words Their Way Our Way blog post, you've seen our schedule of tasks when working with a sort. I've learned that on a couple of those days, students tend to finish rather quickly with about 15-20 minutes left. This was when I wanted to try to establish some word study tubs using some of those awesome centers I had stashed away. So, on the cutting day and the gluing day, my students use the tubs (which are just four ice bucket tubs from Walmart!). CVC Tub: This is a Center by the Minute resource from Babbling Abby that we love! Sentence Making Tub: This is a very old resource I used during my first year of teaching. Such a great way to practice sight words, too! Word Family Tub: Reviewing the word families we worked on the week before break! This is a great resource from Lavinia Pop! Instead of doing a Sight Word Tub this week, we did another CVC/Word Family activity. This is an awesome resource from A Printable Princess! We all have favorite center activities or TpT authors who we always go to, so include what you like to use! And make it fit what your students need to work on. On day 4 of our sort, the writing day, some of my students finish very early and others take the entire time to write. I have an extension activity for those early finishers called Making Sentences. Each extension correlates with a sort that we are working on and may also review past sorts. I love how my students laugh when I read the sentence all mixed up. I also tell them what the sentence should say ONCE, and then they go off and attempt to make the sentence on their own. This is from one of my students who typically struggles to write any kind of sentence on his own. I was so proud of him! One of the reasons that I love this extension is that it shows me not only that students can make sense of words but also understand their meaning. The illustration they draw to match the sentence shows me that they are able to use the words on their own. If you'd like to try this extension, you can grab it by clicking HERE. ...so we have taken the sight words from these books and made our "list." There were a few surprise words that I wasn't expecting to teach my K's, or maybe not in the order that I'd taught them before, but it's basically just another iteration of the "list" we've all used in the past. So all that to say: Teach the sight words that the kids will SEE and READ on a daily basis! I plan on making another video while I'm teaching this, so be on the lookout on my Instagram for that! It's much easier to show than to explain :) In the meantime, click HERE to watch my old video (it's my most-viewed video on my account)! Well there you have it, a LONG (sorry!) but hopefully informative explanation of Word Study in our classroom. Do you have a Word Study/Phonics time in your room? I'd love to know! Check back soon for Part 5: Reader's Workshop! Thank you SO much! The longer the post, the better for me :). I so look forward to these posts each week and have already implemented many of your ideas!!! I too look forward to these posts. This is my 8th year teaching, but my first year in kindergarten. I used to teach middle school, took several years off to be a SAHM, and now I'm back and loving kindergarten! I use your ideas on a regular basis, so thank you for sharing. Question for you (and I apologize if I missed this detail when reading your posts): when do you work with reading groups for Guided Reading? I use my centers time for it, but I'm always looking for ways to tweak my schedule. Hi Megan! Thank you so much for those sweet words. I'm so glad these ideas are helping you! I do guided reading during reader's workshop which is my next post in this series!! That makes perfect sense. I'm looking forward to the next post! Hello! Love this post! 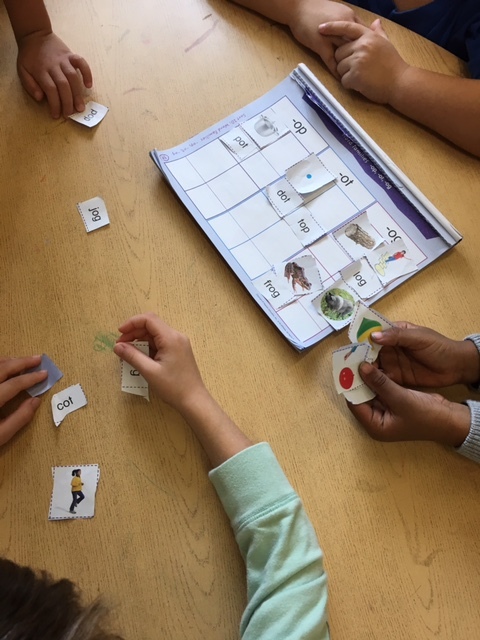 When do you use the decodable readers? And how do you use them? What do you do for the students who are behind in their sight word knowledge? Thanks!